Vida Colorado: #10.2: Czech Republic. The Old Fortress. 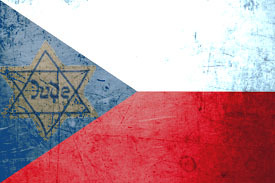 In the spring of 1939, the city of Prague had a Jewish population of over 90,000. Today less than 2,000 remain. Most of these 90,000 saw their way through Terezín at some point in the early and mid 1940's and from there met their fates after being shipped to places like Auschwitz or Mauthausen. While conditions in Terezín were "good" by comparison to the extermination camps of the east, what set this place apart from all others was its use in Nazi propaganda as a "model" camp where conditions were made to appear great and art and creativity were encouraged. Self government was allowed; there were cafes, shops, parks and circulated money. Artwork was permitted and even encouraged. Children's choirs performed operas and jazz musicians filled the streets with cheerful music. There was a deception happening in Terezín unknown anywhere else. This "spa town," as it was referred to in Nazi literature, was where aging Jews could go to retire and live out their days in peace while the rest of Europe had to writhe in the agony of ongoing war. It was where artists could spend time refining their craft and performing for their fellow Jewish brethren. Red Cross inspectors of the camp were treated to performances by the children's opera, kids playing in the park, and the local government in action, with town meetings and all. It was as if all of Terezín's inhabitants were playing the part in a movie that they knew would have to end eventually; maybe some wanted to believe so much that it was true that they actually did; and those who refused to play the part? Welcome to Auschwitz. Terezín today is an actual inhabited city; when we arrived there was little sign of life, though. Snow was falling and perhaps the cold was keeping its inhabitants inside and any other visitors away. The silence which follows newly falling snow; the lack of movement or signs of life; the drab paint on the old buildings; this all gave Terezín a somber if not eerie feel. It's a city caught in a struggle of commemorating its past and in establishing a sustainable modern economy. The struggle is a strange one: on one hand you can visit the crematorium which incinerated the bodies of the victims of Nazism and see Stars of David erected in memory of the mass murder going on here; but you can also sit down and order a goulash dinner in a restaurant occupying the former SS Officers' quarters; you can stay overnight in a hotel that used to quarter Nazi guards that advertises itself to be "a romantic getaway" (the silence of one particular era on its "history" page speaks much louder than words could). Frankly, I left Terezín a little bit confused. As a WWII history nerd for years, I had lots of ideas and pictures in my mind of what a "concentration camp" should look like, and although this was not exactly of that same category, the old fortress of Terezín simply did not fit this mold at all. New life has blurred with old, and in a some small but odd way, just as in 1944, the town feels like it's still hiding something to this day. The Jewish population of the Czech Republic after the war was virtually eliminated. Of those that did survive, many found a new start in Israel preferable to trying to rebuild a life in the same homes whose walls now told stories of horror and sadness. Their story is one we all should remember; a visit to Terezín is just an hour's bus ride out of Prague, and it's one you should take if you're there.